A Monument and a Scientific Laboratory. The Monument, as it is known, once stood proud above the skyline of the Unfinished City, offering unparalleled views of the great city. Since its construction it has now been dwarfed by the newer buildings in the area, which has led me to wander past this icon, without even noticing it. Today was different, and I managed to grab a shot, whilst trying to avoid the hundreds of tourists and business types. 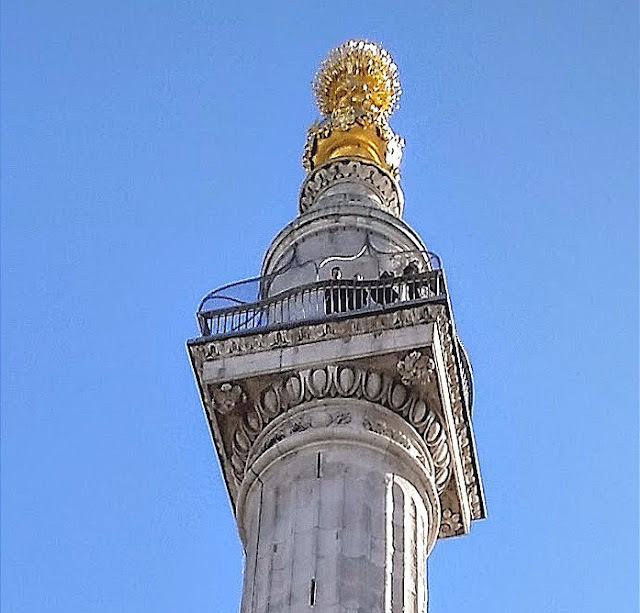 Following the Great Fire of 1666, (there were other fires which caused more damage), it was decided that a permanent memorial should be built to commemorate the fire and to celebrate the rebuilding of the city. Sir Christopher Wren and Dr Robert Hooke designed the antique-style Doric column, which contained within a cantilevered stone staircase consisting of 311 steps. These steps would lead to a viewing platform, beneath a drum and a copper urn, from which flames would emanate. Work on The Monument began in 1671, with Portland Stone being the selected material for its construction. with it being completed in 1677. Originally, Sir Christopher Wren had intended for the Royal Society to use the monument for various scientific experiments. However, this was soon discontinued when vibrations, from passing traffic, interfered with the results. In late August, of 1842, following the death of the sixth person to jump from the viewing platform, The Monument was temporarily closed, while an iron cage was placed around the viewing gallery.